Aileen McGlynn and pilot Helen Scott secured Britain's first medal on day two of the Paralympics with tandem silver behind Australia in London. 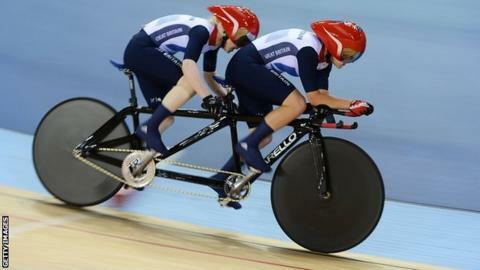 The Britons set the fastest time as the penultimate pair in the blind and visually impaired tandem one-kilometre time-trial at the Velodrome. But world champions Felicity Johnson and Stephanie Morton overhauled them in the final run to grab the gold. Britain's Lora Turnham and pilot Fiona Duncan finished in fourth place. Glasgow's McGlynn, 39, won gold in Athens and Beijing with Ellen Hunter but finished behind the Australians with new partner Scott, from Halesowen, at the World Championships in Los Angeles earlier this year. A personal best of one minute 09.469 seconds for the British pairing could only secure silver on Friday, with New Zealand's Phillipa Gray and Laura Thompson taking bronze. "I'm a little bit disappointed but at the same time I'm really pleased to win a silver and it's good to have got a PB as a team together," said McGlynn. "I'd like to thank the crowd for coming along and supporting us so much." Welshman Mark Colbourne set a world record of 3:53.970 as he qualified fastest in the men's C1 individual pursuit, with the final at 15:45 BST.